With characteristic showmanship and panache, international performance and media artist Barbara Rosenthal introduced three of her video compilations to several eager audiences in Melbourne, Australia this month, with talks billed as “Authenticity in Art” and “The Medium is NOT the Message.” Touring Melbourne, Sydney and Brisbane as a guest-of-the-fest of Channels Video Festival, and hosted in Melbourne by Monash University and Victorian College of Art, this bold, frank, energetic, introspective, self-effacing, idiosyncratic 65-year old New York avant-gardist noted as “Old Master of New Media” during her winter tour of Europe, presented here an overview of her philosophy of art and of her career, as she launched into screenings comprising almost 50 of her over 100 video shorts, with questions and discussion after each program. 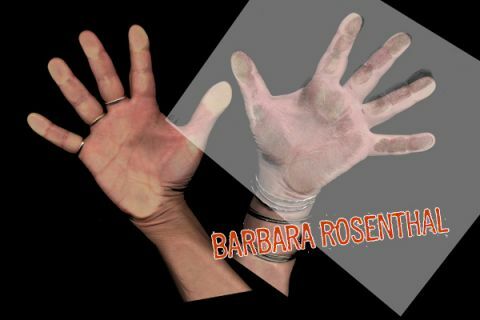 Barbara Rosenthal, a deep thinker known for expressing Existential themes in her art, is a passionate character with wild red hair, bursting with words and ideas, prolific as an artist for 50 years. She takes from her own life everything she encounters – physical objects, experiences, family members, clothing, medical data, landscapes, buildings, insects, animals, discarded papers, old rags, her dead father’s architectural supplies, her children’s toys, speech patterns, her own body, etc. Everything seems to be fair game for her to draw upon, and through relentless reflection and introspection, coupled with her photography and drawings, plus puns and phrases by herself or from the fiction and cartoons she reads, turns into original, metaphysical, and sometimes absurdist art, revealing insights into what makes us human. Her material all comes from her own life, yet everyone else can relate to it. We talked about new technology and the effects that social media have on journal writing today. Rosenthal believes that Facebook is sucking analytics away from journal writing and writers. Whereas a daybook lets our thoughts run free in our own privacy and own time, now we answer to Facebook about how we feel, and endure comments ready or not. Although she nevertheless has several Facebook accounts, which she designates for selective purposes, she encourages people to keep notebooks besides, or otherwise much is lost, especially meanderings which lead to deeper ideas. “These things put Barbara Rosenthal undeniably in the realm of Conceptualism,” continued Professor Bolt, “but they operate on the level of affect, which we read as meaning. Her incredible intensity is not unlike that of Marina Abramovic.” Yet, whereas Marina’s intensity causes that artist to remain silent and immobile, such as in her recent show at the Museum of Modern Art in NY, Rosenthal’s intensity is dynamic.